Egypt's Former President Morsi Sentenced To 20 Years In Prison : The Two-Way Less than two years after he was removed from office by the military, Mohammed Morsi was sentenced by an Egyptian court for the arrest and torture of protesters. Egypt's former President Mohammed Morsi gestures from the defendants' cage during his trial in Cairo on Tuesday. 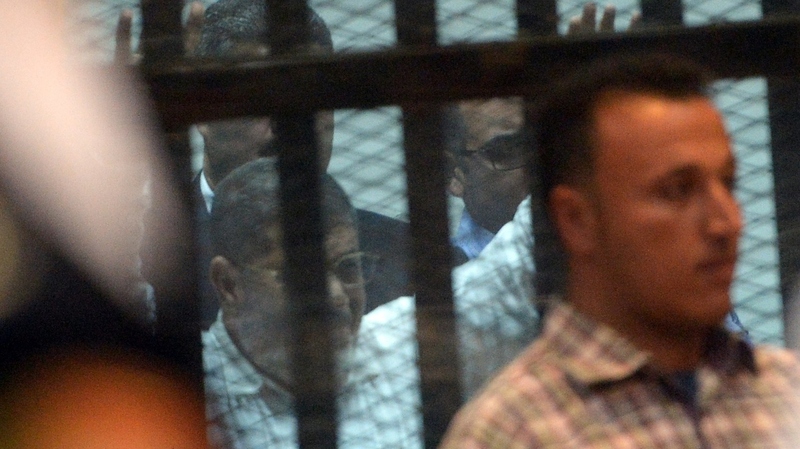 An Egyptian court sentenced the ousted leader to 20 years in prison for abuses of protesters. Less than two years after he was removed from power by the military, an Egyptian court has sentenced former President Mohammed Morsi to 20 years in prison for the arrest and torture of protesters during his tenure. The charges stem from the months of protests between late 2012 and July 2013, when Morsi was kicked out of office. Twelve other defendants were also found guilty and received the same sentence as Morsi; they include former Muslim Brotherhood legislator Mohamed al-Beltagi and Essam al-Aryan, the group's former spokesman. The defendants' attorneys say they will appeal the verdict within the next two months. There were a total of 15 defendants in the case; seven of them are fugitives. It's the first conviction against Morsi; he and others were acquitted of murder charges that could have exposed them to the death penalty. Morsi still faces several other charges, including an accusation that he colluded with — and gave secret information to — Iran. Since Morsi was removed from office, the Muslim Brotherhood that backed him has been banned; a court also sentenced hundreds of its members to die.